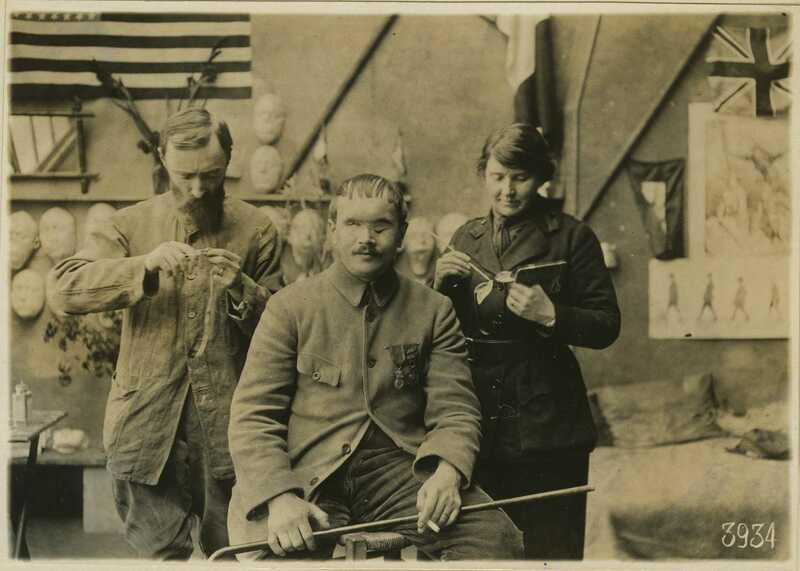 In the closing stages of World War I, an American sculptor named Anna Coleman Ladd (above, right) created a special studio in Paris for the Red Cross. There, she and her assistants made new faces for soldiers mutilated in combat. In addition to supporting the studio, the Red Cross paid film crews to document the work done there. This film has survived. We present a full and verified copy of this film in digital form in this SourceLab edition, with accompanying critical commentary discussing the film's origin, preservation, and current location, as well as how it may be cited in scholarship. For comparison with the testimony this film provides, we also include a written Supplemental Source. This is the article "The Men With New Faces," published in 1917 in the British literary magazine The Nineteenth Century and After. This edition is a public prototype of a proposed series, intended for use by students and researchers. We would greatly appreciate your comments and suggestions. Please write us at SourceLab2015@gmail.com.